Chinese bus brand Higer has reversed flagging sales in its coach range, recording brisk business in recent months. During July, Higer delivered 14 vehicles of which 11 were the 8.5 metre Ryder 33-seater midi-coach. Picking up a Ryder during the recent boom month was Melbourne-based tour operator Go West, a specialist in day touring along the Great Ocean Road and down to Phillip Island. Go West's Managing Director Terry Smit says long established bus brands have deserted the mid-size market and left a void that has been filled by suppliers such as Higer. "We didn't need or want a big coach so we looked closely at three brands in that sector and Higer emerged as clearly the best choice," Smit says. "You feel like a pioneer taking on a new and largely unproven brand in this market but the team at Higer communicated well and the two year bumper to bumper warranty was a major reason why we chose the Ryder," he says. Smit says there is a risk with any new vehicle, with most vehicles having some ‘niggles’. He says the support behind the vehicle makes a difference. "We were very confident Higer's dealer network and support was strong," says Smit. "We did our research and the Higer stood out as being the most solid choice." Part of Smit’s risk assessment of the Ryder was to check over the engine and transmission. "The Cummins engine and Allison transmission delivers a proven driveline and that provides peace of mind for the operator," he says. Smit adds that while Higer’s low price point was a major attraction it was a combination of a number of factors that sealed the deal with distributor Prestige Higer. "The price was certainly a major attractor but I had to be sure that we were buying a strong overall package with good after sales support, strong reliability, good fuel efficiency and the right package size and configuration," he says. "We made the mistake of purchasing purely on price several years ago when we bought what we thought was a solid second hand coach but that turned out to be a bad investment and cost us a lot in repairs and down time." 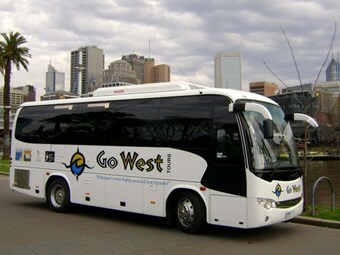 Go West chose to fit just 29 leather trimmed recliner seats rather than the full 33 seats to ensure passengers have a more comfortable and exclusive experience while touring. "When you are taking a small group of guests on a 600km tour down the Great Ocean Road and back you don't want them packed in like sardines, you want to give them a great experience with a degree of comfort and safety that sets you apart from the others," Smit says. "A coach like this has to be a workhorse but it needs to be a luxury workhorse that gives passengers a great experience and a safe feeling, in this regard a fully seat belted coach is most important these days and the Higer Ryder again ticked all the boxes on those points." One of the things that clinched the deal for Terry Smit was the availability of a demonstrator coach for an extended period which allowed the company to fully appraise the Higer, a factor no other manufacturer matched. "The fact that we could test the Higer for a week meant we got a feel for the vehicle and ensured there were no hidden surprises when we purchased the coach and put it to work," he says. Along with its Higer Ryder 8.5 metre Go West operates five other 25 seat mini buses and a 16 seat van based bus to service the growing demand for small luxury tours.